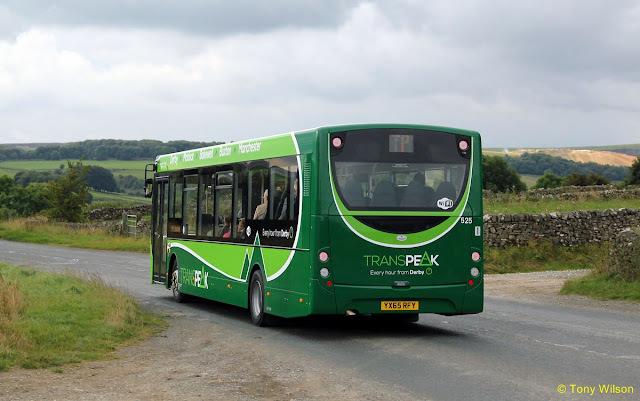 The latest livery to adorn buses assigned to the Transpeak (TP) route (Derby to Manchester via Belper, Matlock, Bakewell, Buxton and Stockport), has recently been revealed. Operated by the High Peak Bus Company based at Dove Holes north of Buxton, four brand new Alexander Dennis Enviro200 single-decks are in the process of introduction onto the route. Apparently the first one out is fleet number 525 and is illustrated in a set of images taken on the 17th September. 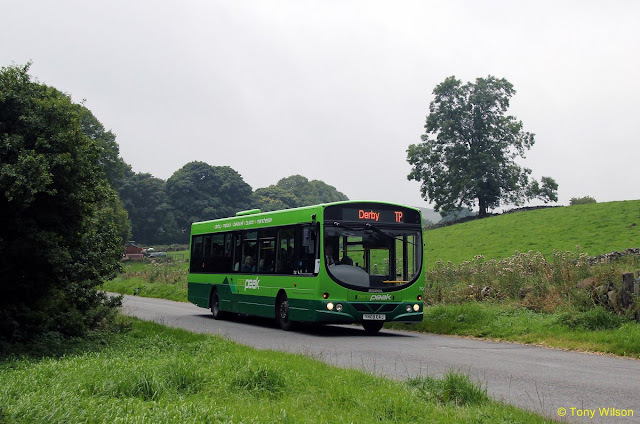 Number 525 pulls out onto the former A6 trunk road from the north end of the quaint Derbyshire Peak District village of Ashford-in-the-Water on a short run from Derby to Buxton and illustrates the offside aspect. 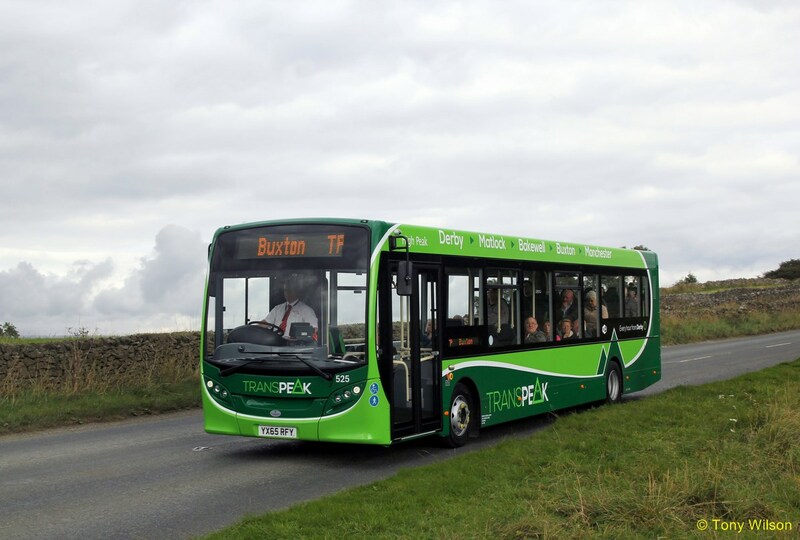 The nearside aspect is shown off with the bus travelling briskly further out in the sylvan countryside of the Peak District near to Chelmorton. At the same location and a quick pan of the camera, the rear nearside aspect is shown here. Four similar buses numbered 591-594 were delivered during the second half of 2014 and sported Centrebus livery with Transpeak route branding. This appeared to be at odds with the 50/50 joint venture between Centrebus and the Wellglade Group to run the service with suitably liveried green vehicles. 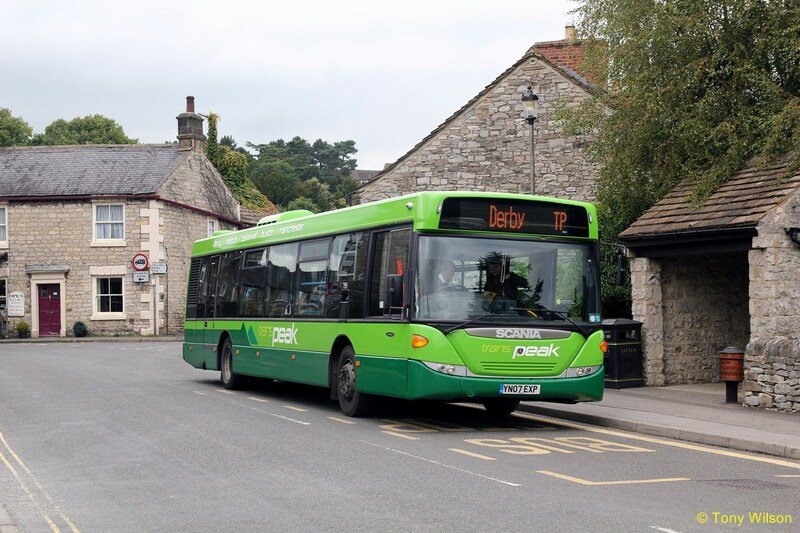 These buses are in the process of having the route branding removed as the new green liveried buses take to the roads. These Centrebus liveried vehicles are understood to be cascaded to other operations within the empire. Number 594 rushes southwards along the A515 at Brierlow Bar. 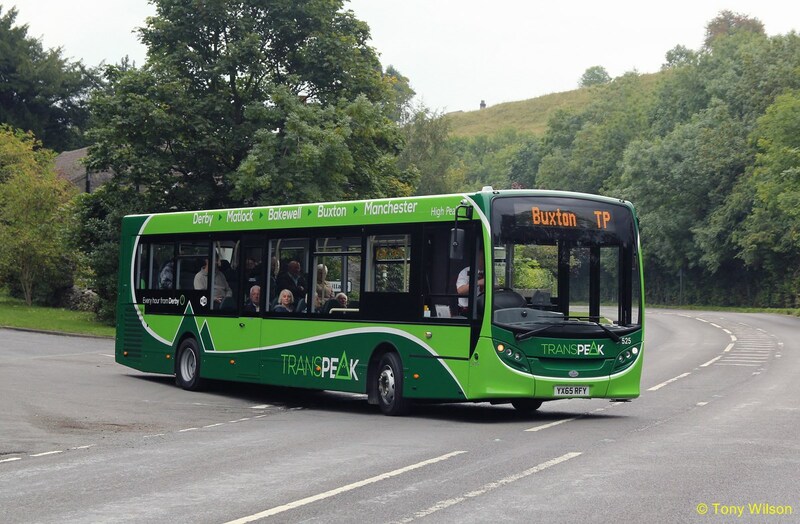 Three further buses operate the route in an earlier green version of the Transpeak livery. 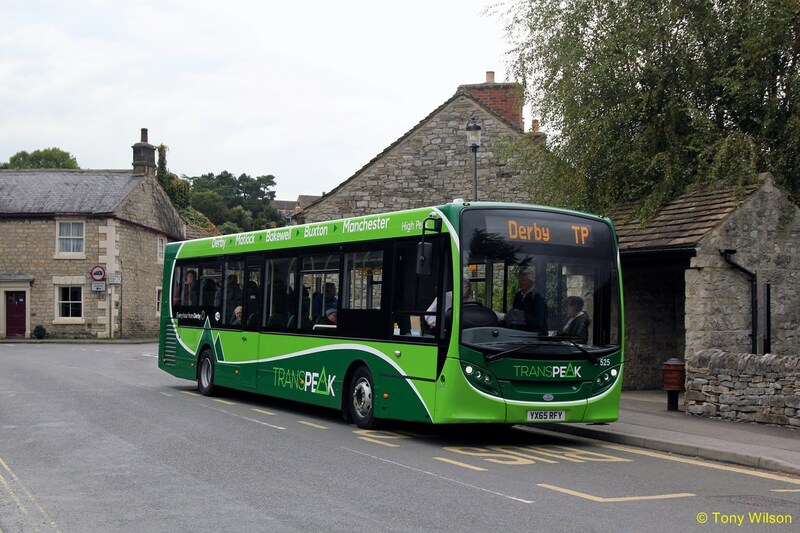 One 748, is a Wright Solar bodied Scania here leaving the village of Taddington. The other two are all-Scania OmniCity models as illustrated by number 789 as it paused by one of the southbound bus stops at Ashford-in-the-Water. Number 525 is also shown at the same stop with the backdrop of typical locally stone constructed buildings. 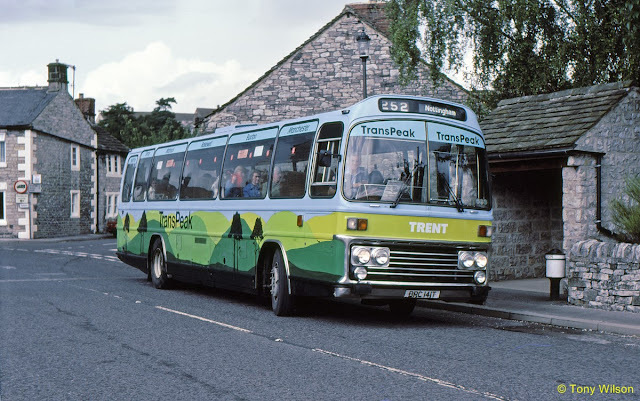 By coincidence thirty years ago on the 16th August 1985 the TransPeak service looked a little different when operated by the Trent company. 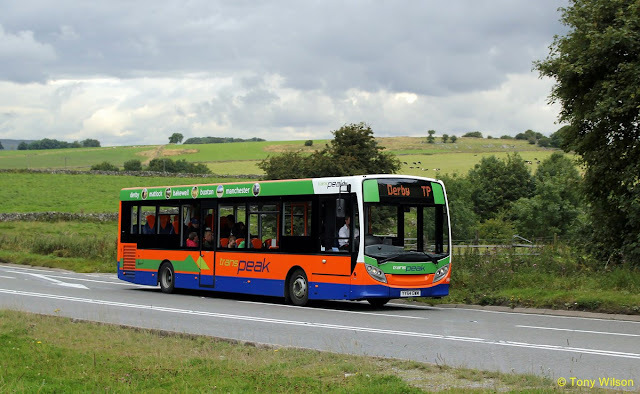 A small fleet of Leyland Leopards with Plaxton bodywork were operated in a livery that presumably represented the Dales and Peaks and the sky above. 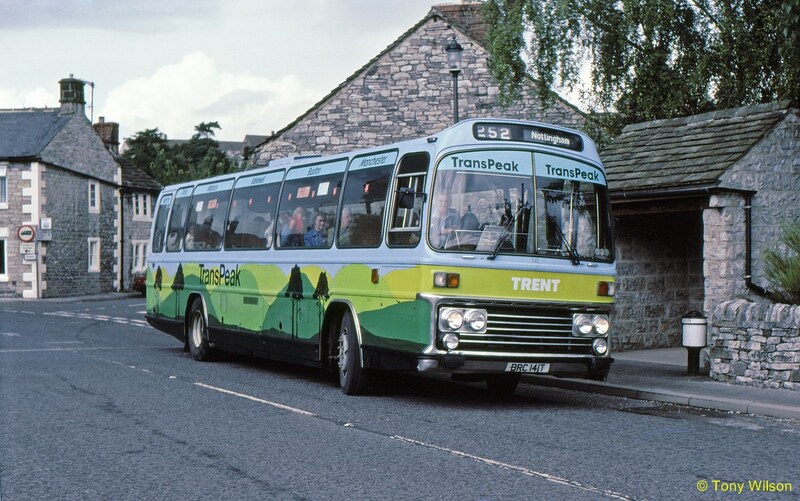 Back then the route was numbered 252 with the TransPeak branding and operated between Manchester and Nottingham. Little appears to have changed with the surroundings when compared with the September 2015 image. Apart from the vehicles, the most visual changes are drainage pipes on the bus shelter and the mile post beside the vehicles.